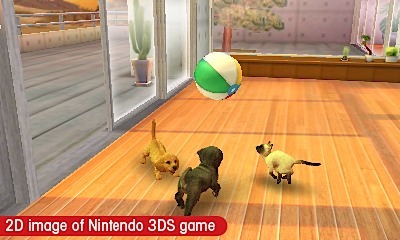 As the best-selling first-party franchise on the Nintendo DS, Nintendogs was a shoe-in to get a sequel and Nintendo was smart to bring it out on their brand new Nintendo 3DS platform. As if owning and raising a virtual puppy wasn't already cute enough in 2D, the introduction of the third dimension adds even more charm to this franchise, and it's really the closest you'll ever get to owning a dog without, well, actually owning a dog. Let's be straight here, if you've played the original Nintendogs this game is pretty similar in most regards. The interface in Nintendogs + Cats is pretty much a carbon copy of predecessor, although there has been minimal graphical upgrades such as better textures for your pet's fur and house furniture. Gameplay consists of selecting your first puppy from the local dog kennel and just like in the original game you will spend most of your time bonding with your furry friend, taking it for walks and teaching it tricks. The new sell points here are the inclusion of full stereoscopic 3D, which literally lets your pet pop out to lick your face or shake a paw, and as the title implies, for the first time ever the franchise is introducing breeds of cats. The 3D effects are really impressive and give your dogs and cats much more of a lifelike feel than before. The visual depth really becomes apparent as your dog darts around your home while interacting with toys such as balloons or a frisbee. Surprisingly cats add very little to the game since they behave much like their real-world counterpart, i.e. independent and aloof. Whereas you can teach your dog up to three tricks a day, don't expect much interaction with your cats aside from buying them climbing towers and feeding them dry mix and water. Progression in the game happens very linearly, when you first start out there are nine breeds of dogs to choose from such as Beagle, Shiba, Dachshund, Great Dane, and Golden Retriever. Once a breed is selected you can choose from different types such as a Tricolor Beagle or a Lemon & White Beagle﻿ depending on your preferences. Purchasing your first dog will blow most of your budget so in order to get a second dog, or your first cat, you'll need to earn more money through winning dog competitions or selling items your dog finds during walks at the local Second-hand Store. Competitions range from Lure Coursing which has your dog chase a lure that you slowly wind towards the finish line, Disc Competition where the objective to throw a frisbee for distance and have your dog catch it, and Obedience Trail where points are awarded based on how your dog responds to specific commands. Each competition is only available twice during a real-world 24-hour period, which is irritating when you want to earn cash for more pets, pet accessories, or to remodel your home. What's nifty is after your dog gets familiar with your house you can then name it by recording its name using the Nintendo 3DS microphone. Your dog will responds to its name when spoken back into the microphone, and as your dog learns obedience it will come to you more quickly, as well as perform tricks on command. One drawback is that you have to speak very plainly, without background noise, for your dog to hear you properly, and if you pass your Nintendo 3DS to a friend don't expect your dog to recognize other voices. Aside from the usual grooming, bonding and trick learning, you're also able to take your dog for walks throughout the city. Walks happen down a straight path, with the odd intersection where you can change direction, and there are a few places to visit such as the local park to practice disc throwing and a cafe that makes treats for your canine friend. Of course you can also customize your home through purchasing furniture such as a dog bed or a living room sofa. 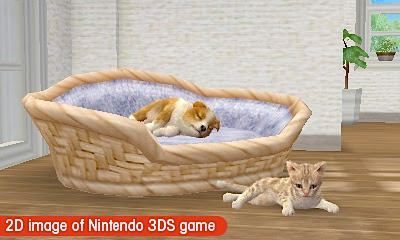 Nintendogs + Cats is a great showcase title for the Nintendo 3DS and I can see this game appealing to a wide range of gamers based on its charming appeal and pick-and-play gameplay. 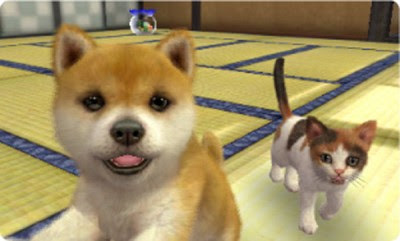 If you've ever wondered what it would be like to own a dog or a cat, but aren't sure if you want to put in all the effort required to maintain a real one, Nintendogs + Cats is the next best thing. But is this game aimed at kids, or would a teenager enjoy it too? It doesn't really look like a particularly challenging game, more like something that is cute and fun.